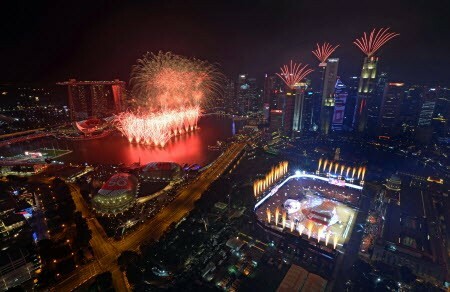 Independent Singapore turned 50 Sunday with fireworks, a massive military parade and a tribute to late founding leader Lee Kuan Yew, who helped transform it from colonial backwater to regional powerhouse. Lee, the authoritarian ruler who died in March aged 91, was honoured with a video on his life and times at the beginning of the annual National Day Parade, the first he had ever missed. 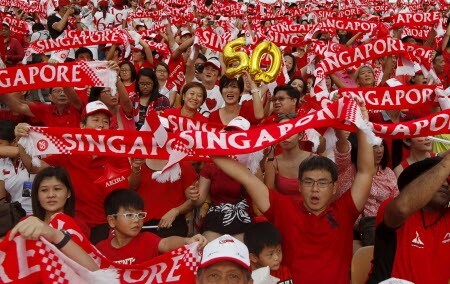 The crowd — decked in the red and white Singapore colours and many in tears — greeted the tribute with a robust round of applause. 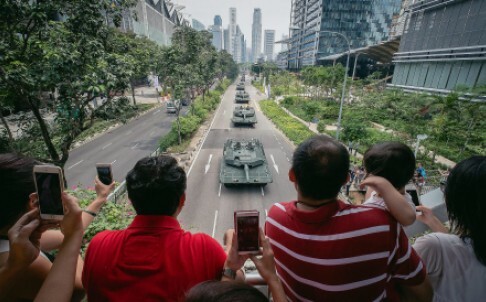 The festivities that followed featured about 2,000 marchers, 50 military aircraft, 177 tanks and other security hardware, underscoring the Singapore military’s status as the best armed in the region. 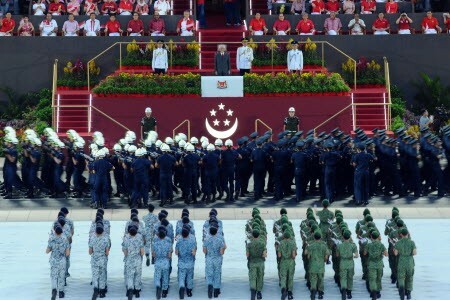 One of the highlights was a fly-past by a Singapore Airlines Airbus A380 superjumbo adorned with the republic’s red-and-white flag featuring a crescent and four stars. SIA became the first airline worldwide to operate the double-decker plane in October 2007. 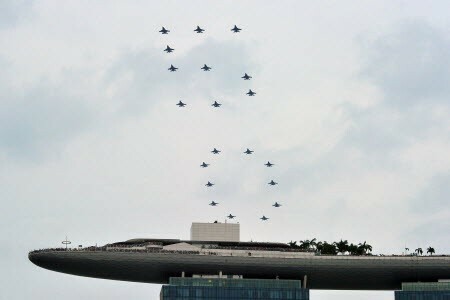 The crowd also cheered when 20 F-16 fighter jets formed the number “50” as they roared overhead. Minutes later, helicopters including Apache attack choppers flew by. 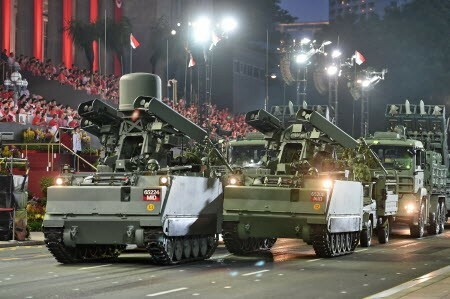 Battle tanks led the mobile column that showcased the city-state’s powerful military arsenal, including ground-to-air missiles and drones. 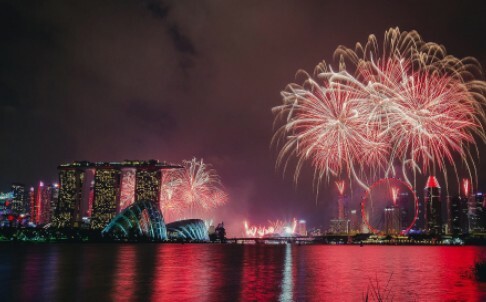 Singapore became a republic on August 9, 1965, when it was ejected from the Malay federation following a stormy two-year union — to face an uncertain future in a turbulent region. The tiny island with no natural resources has since surpassed vastly larger neighbours Malaysia and Indonesia in terms of development, with per capita gross domestic product of $56,284 last year. But critics say its success has come at a steep cost. The People’s Action Party (PAP), which Lee co-founded and which has ruled uninterrupted since independence, has been criticised for silencing free speech, detaining political opponents or launching costly defamation lawsuits against them. 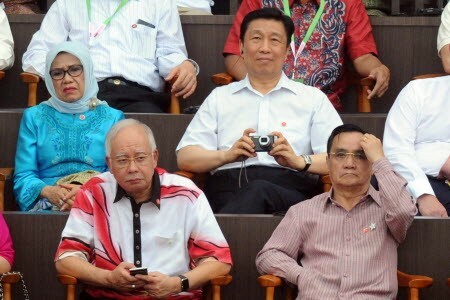 But politics was put aside Sunday when sirens blared at 9:00 am before national TV and radio stations broadcast a 2012 recording of Lee Kuan Yew reading the original declaration of independence. 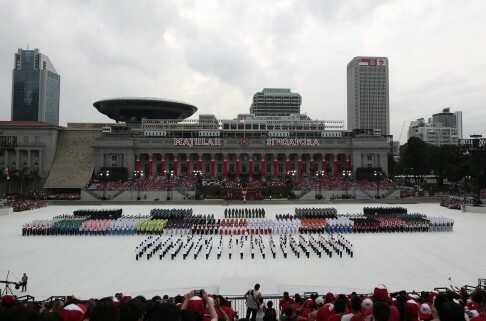 On the eve of the parade his son, Prime Minister Lee Hsien Loong, said in a televised message that “at 50 years, as we stand at a high base camp, we look back and marvel at how how far we have come”. 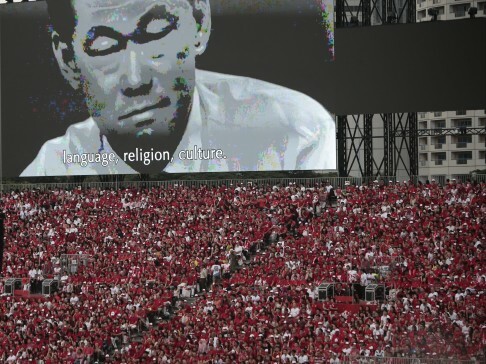 Lee Kuan Yew’s death on March 23 triggered an unprecedented outpouring of grief. A bouquet was placed on his customary seat at the parade. 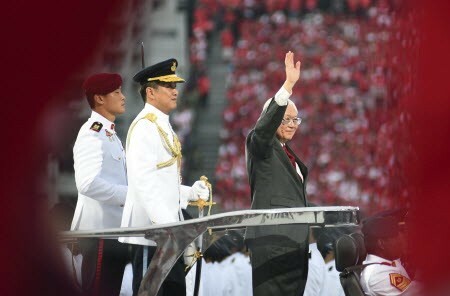 He handed over power to his deputy Goh Chok Tong, who in turn stepped down in favour of the former leader’s son in 2004. 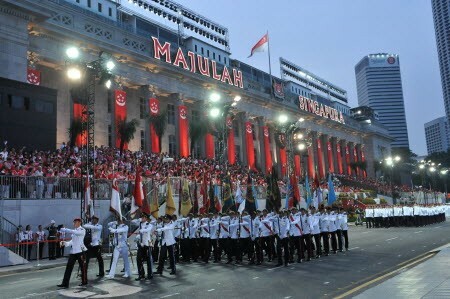 The PAP suffered its worst electoral performance in 2011 when it won 60 per cent of votes cast, its lowest ever, despite retaining 80 of the 87 seats in a block-voting system. 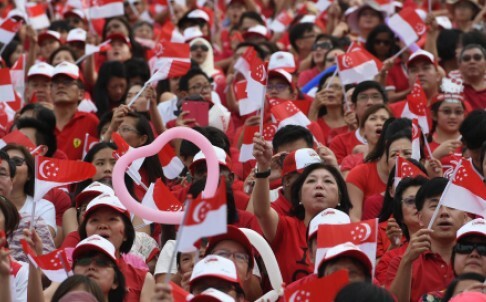 Popular opposition to immigration was blamed for the PAP’s weakened showing at the last election, when the opposition Workers’ Party wrested a five-seat constituency from the PAP for the first time. 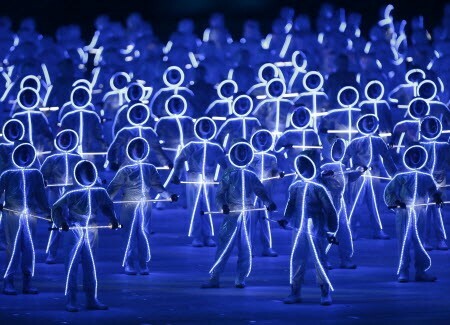 Singapore’s low birth rate, coupled with its rapidly greying population, prompted the government to liberalise immigration policy in the mid-2000s, with the population surging from 4.17 million in 2004 to 5.47 million last year — 40 per cent of them foreigners.